This morning I decided to make a very simple, humble, Christmas tree craft from my pine cone stash. I am really craving simplicity this year in my holiday decorating, and I promise that there is nothing simpler than this craft! If you have pine cones in your yard (or your neighbors—promise we won’t tell :)), then you have the makings of baby Christmas trees! All you need for this craft are pine cones, 1 sheet of card stock, book pages, baby buckets, and some optional filler items. To make the book page stars, I used Martha Stewart Adhesive Spray to adhere the book pages to both sides of a sheet of card stock. Next, I ran the card stock through my Silhouette and cut out various sized stars. 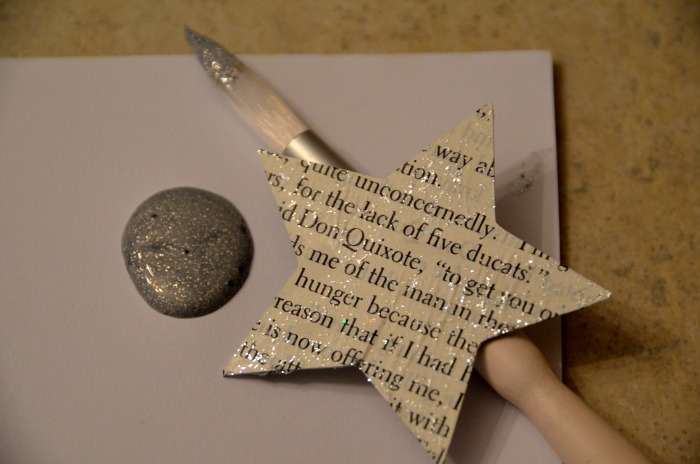 To give the stars a bit of glam, I painted them with some silver glitter paint. 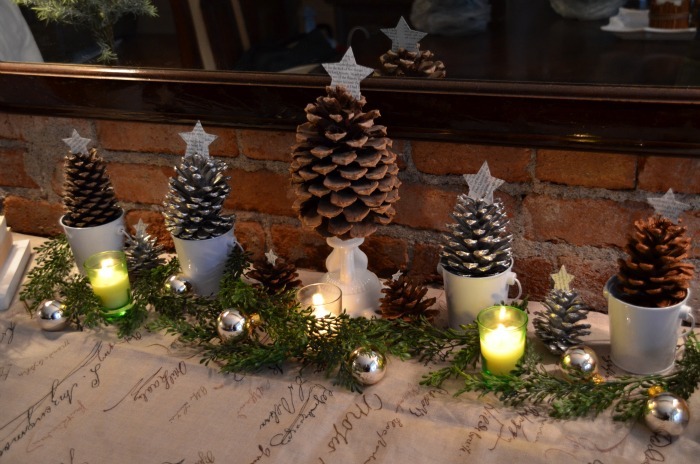 The silver pine cones were leftover from the chalkboard ornament wreath I made last year. I spray painted those with Sterling Silver paint by Chase and love how shiny they turned out! My pine cones are resting in little $.25 buckets I found on clearance in the Target dollar spot a few years ago. The moral of this craft story is that simplicity can be cute! Now I’m excited to see what tips and tutorials you have for us this week! Hey girl – those are super cute. I love the stars – perfect and sweet touch. I’m like you – simplifying my style this year. BUT there seems to be a big interest in big, blingy door decor this year so I dusted off my tutorial and updated to share here. Your pine cone topiaries are adorable! they look beautiful on your mantel! Thank you for hosting, once again! I have linked up my chandelier makeover. 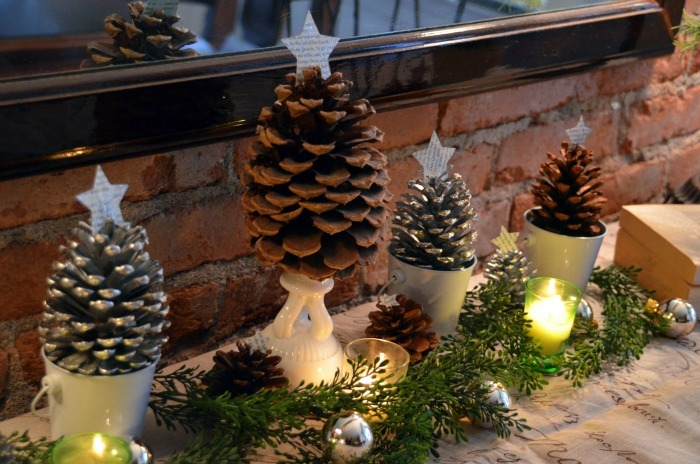 Your pine cone display is GORGEOUS! My sweet little girl has been helping me collect pine cones too. OR pine CORNS as she calls them!! I LOVE your “optional filler” what is that? it’s beautiful! These are gorgeous! You are very creative! Thanks for hosting, Beth! Hope you have a wonderful Thanksgiving! OMG, I’m pretty sure I just maxed out my tab window’s with all the link up’s I want to visit! AMAZING PROJECTS today! How cute! I love simple and I love pinecones. pinecones? glitter? of course they’re gorgeous!! Thanks so much for hosting. I hope you and your family have a safe and happy Thanksgiving. Simple is definitely pretty! Loving the book page touch. Happy TG! Love the tutorial and thank you for hosting. Happy Thanksgiving. very pretty! so simple, but gorgeous. on another note, beth everything always looks so neat & tidy on your blog. even your link party. everything is so stream lined. gorgeous work. Such lovely little trees! Thanks for hosting such a fun party! I love your little pine cone trees! You always have a way of taking the ordinary and making it beautiful! Thank you so much for hosting another fabulous party. Love! It sometimes is the most simple things that end up so pretty! 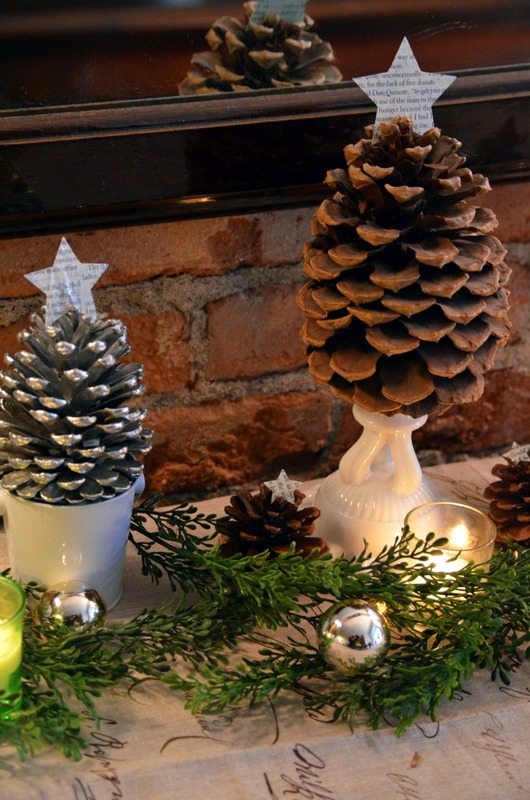 I have a pinecone stash too and can just see these on my Christmas mantle. Great idea! Thanks so much for hosting! I have been following you for about a year (FB too!) and now I am a brand spanking new blogger just learning the ropes. I’ve linked back and I hope you like my posts! Happy Monday. Welcome Sherry! So glad to have you link up! 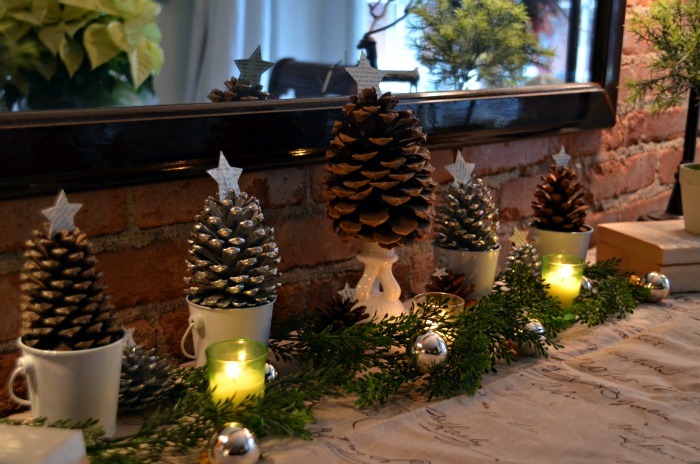 Beautiful pine cone display! Thanks for sharing and thanks for letting us link up! Your pine cone trees are wonderful! Thanks for hosting.